A family relation of his tells us that the runner with the moustache and jersey racing in front of the bulls is Paco Gómez, a former goalkeeper of both Osasuna F.C. and Real Murcia F.C. We have found a vintage postcard on sale at ebay at a price of fifteen dollars and this led us to discover a story that went much deeper than it first seemed. At first sight, it just seemed a nice vintage postcard of a bullrunning event but behind it lies a story about the Pamplona Running of the Bulls and the fiesta report that Janet Harper sent to Jay Culver, one of the most important publishers in New York in those years. 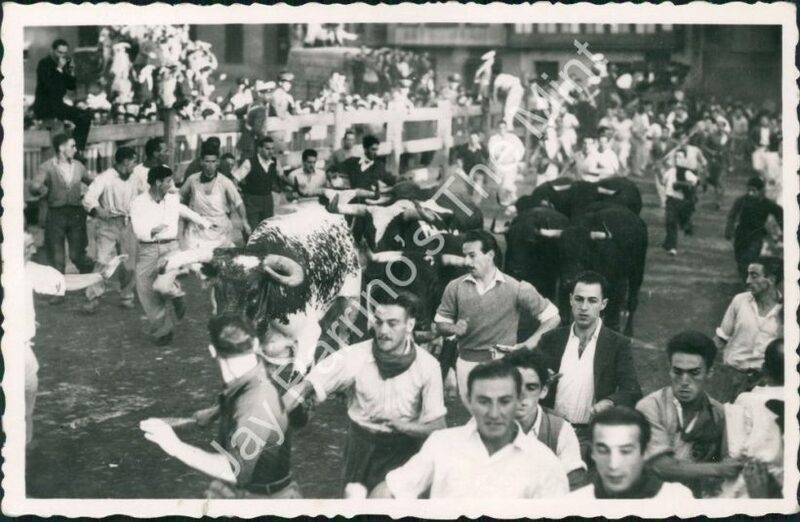 The front of the postcard shows a clear, good-quality image of the Sanfermin Bullrunning in black and white, showing a compact pack of bulls and various runners leading them towards the bullring. The background shows an image taken almost straight in front of the runners and the picture was most likely taken from the right side of the fencing just at the place where the present-day Paseo de Hemingway joins the corner of Juan de Labrit Street and it is clearly taken from a low angle. We can see the faces of the runners clearly and it also shows some photographers in their suits, some rather heavily dressed runners and just a few neckties worn by some of the people. If any of you recognize any faces, please let us know by writing to info@sanfermin.com. We can also make out in the background the corner where our Kukuxumusu store at 76 Estafeta Street now stands. However the most interesting thing of all is to be found on the reverse side of the postcard. 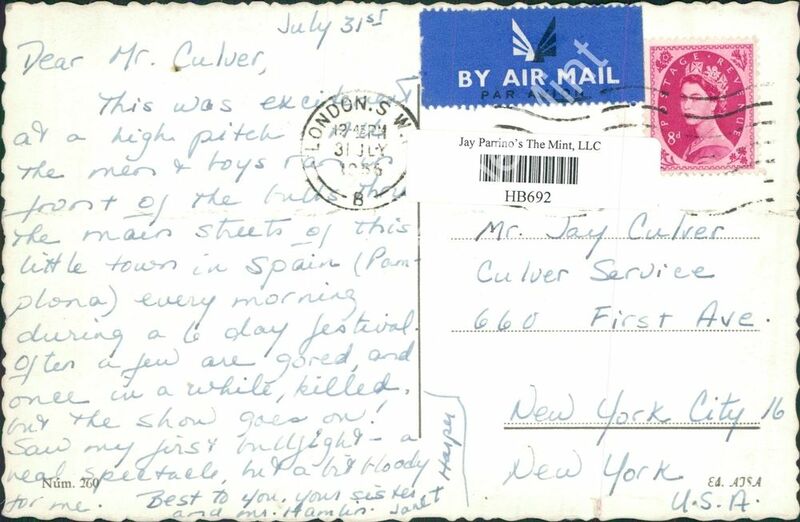 Here we discover that a certain Janet Harper sent a short note to Jay Culver in New York, all the way from London, dated the 31st of July. The recipients address is listed as 660, First Avenue, in Manhattan, New York. This led us to a possible clue about the recipient who, it turns out had a business there (Culver Service). Further research revealed that this Jay Culver was a founder of Culver Pictures. Ever since 1926 this firm was creating a huge archive of images of the United States at this address in New York. 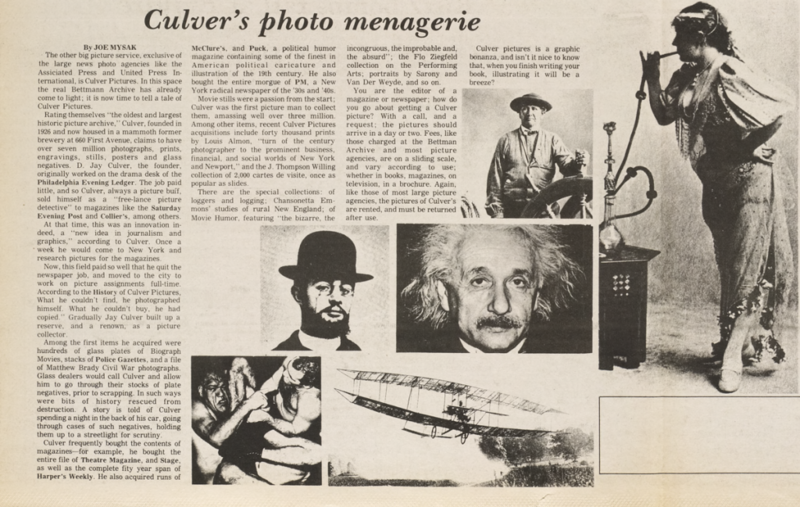 According to an article written by Joe Mysak in the Columbia Daily Spectator on the first of December, 1978, Culver Pictures was as equally big as Associated Press or United press in those years. The receiver of this postcard becomes relevant when we realize that this Janet Harper is letting one of the most important publishers in New York know all about the event that she experienced at the Sanfermin fiestas. The date year of the postcard? We have some doubts about the exact year that the snapshot shown on the postcard was taken. It could have been as early as 1933, 1936, or more likely, 1955. The Royal Mail stamp makes it clear that it was posted the same day that it was written, but the lettering does not make it clear whether it is 33, 36 o 55. However, some details might help clarify this point. 1933 is highly unlikely because the stamp of the Air Mail corresponds to UK Inland Airmail Delivery which only came into being in 1934. What is rather misleading is that in the image we sense that there is a second line of fencing on the left side of the image. Other images from 1936 show fencing with many more people on it and not so sparse as can be seen in this postcard image. We do know that the double fencing was first introduced in 1941 after the frightening experience of 1939 when a Sánchez Covaleda bull broke through the fencing in that year, causing great panic and mayhem around the area of the main square. Consequently, it would be best to conclude that the postcard is from 1955 unless some other detail comes to light or our eyes catch some new revealing information. In 1955, Hemingway had made an appearance in Pamplona for Sanfermin (he returned first in 1953) and many foreigners revived an interest in our fiestas as a result. We know much less about this Janet Harper, but it is clear that she wished to transmit her excitement about the fiestas to this important New York publisher. Harper is a big publishing name in itself as in Harper & Brothers, for example. However, we do not have sufficient knowledge to try to follow up on that line of thought. The present-day seller of the postcard is a concern called MMG Vintage, one of the specialists in selling in this kind of product on EBay. They usually buy up stocks and then sell the items singularly. They do not seem to see any special relevance into this postcard and it seems to be considered as just one more photo of a running of the bulls. This postcard is number 260 in the AJSA publication. We have checked out the book on postcards compiled by Javier Soria, Miguel Echague and Juan Ramón Corpas (Postales de Pamplona -Ed. Caja Pamplona-) and we failed to find this image, or any reference to the Publisher of this postcard. Nor have we found any reference to the postcard in the Works of Txartoa publications or indeed, any others. But perhaps some people out there could help us out because the figure of 260 postcards means that quite a lot were written and sent off in their time.